My original thinking around my Defining Images series was it would be easy and at time of writing I had a clear mental image of how I wanted the posts to be lined up and all. Writing this post has been a good week under way and more difficult than anticipated. My original outline about post should be chronological in time and images that somehow has been a central part in my photographic journey, either as a turning point or a significant learning experience or represent a shift in my approach or interest. The Chronological part though may turn out to be very difficult if not impossible to adhere to. That out of the way let us get to the image itself. 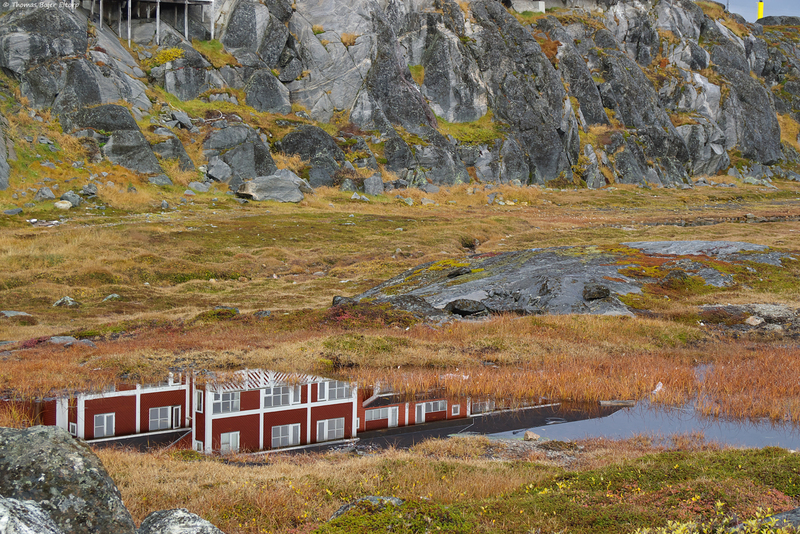 The image above was made in November 2006 and as such part of my earliest photos in Greenland. I had moved to the country a year before and spend it furiously exploring my immediate surrounding with a camera whenever I had the opportunity. I was at the time both technically and in particularly artistically speaking in my early stage. I came across the opportunity after a rainy day, the sky still lined with heavy clouds producing a subdued contrast and pleasing colour palette. Being essentially calm, as the norm after heavy rainfall the water puddles were like perfect mirrors. The reflection of the two storied red wooden buildings appearing upside down in my frame caught my eye, I had found vantage point from where the supporting pillars from the balcony would lend support to the true orientation of the frame without revealing what rested on them. The final decision was to include the yellow post in the top right corner. It seemed to somehow create the right balance between tension between colours in the image. I had at the time not fully formed an opinion or an interest in abstractions in my photographic work and what I did subconsciously would only years later form a conscious tool. It was my first abstract landscape and while I over the year have produced several such images, where parts of the working elements in the image above have been used, I have never produced one quite like it.